You’re quite literally putting your life in these people’s hands, so you want to make sure they are qualified and experienced. Skydiving instructors in the US are required to be certified by US Parachute Association, and are required to complete certain training and currency requirements each year to maintain their rating. A dropzone with strict safety policies will make sure that each of its instructors’ qualifications are up to date, and will only hire reliable and experienced skydivers. It is perfectly okay to ask your instructor about their experience level, just for your own comfort as well! You can meet our instructors on our Staff Page! When researching the best place to go skydiving, people often overlook the importance of good aircraft. Just like the gear, you want the airplane to be reliable, comfortable and well maintained. It is the most expensive part of a skydiving operation. With Groupon and other deals putting pressure on the skydiving operations to keep their prices low, not every dropzone can afford large, fast and spacious airplanes. Most small skydiving centers operate a small 4-passenger Cessna 182 that takes about 20 minutes to take you up to 10,000’. To go higher, faster and with more room, some drop zones use turbine aircraft, which makes the jump more comfortable. At Cross Keys, our main airplane is a Cessna Super Grand Caravan, that takes up to 18 people to full altitude of 13,500’ in about 10 minutes. Skydiving gear is something that is essential for a good skydive, but is a little harder for an outsider to judge. 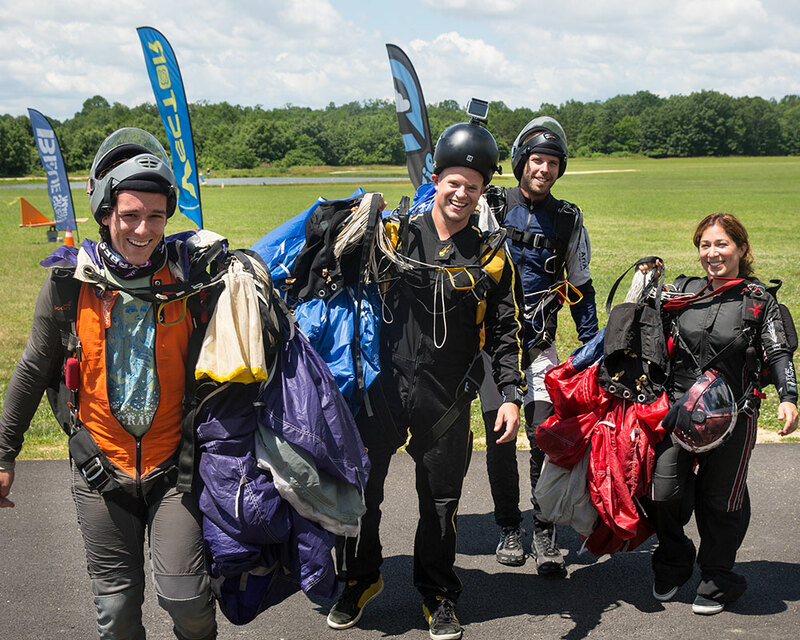 Student gear maintenance is regulated by the FAA and USPA, and a USPA certified Rigger has to be in charge of packing, inspecting and maintaining all tandem skydiving gear. At Cross Keys, we use UPT Sigma systems, which is the industry standard, and we have a team of certified riggers on staff who inspect them after every jump and maintain them meticulously. When you’re getting your adventure of a lifetime documented, you want your photos and videos to be good quality and easy to share with your friends and family. The two most common ways that dropzones offer a skydiving photo / video package are (1) by putting a handycam on a tandem instructor’s wrist, or (2) by sending up a third person, a freefall videographer, to accompany the student and instructor on the whole jump. The handycam method is definitely cheaper, but it shows in the quality. The video is often shaky, filmed from too close, with the tandem pair’s faces taking up most of the screen, and fixed on one angle without showing the scale of the amazing adventure you are undertaking. At Cross Keys, your videographer is a separate person who will jump out of the plane with you and your instructor, fly around you and film the jump at every angle, get both close ups and scenic shots, and also hold your hand in freefall and make your entire experience more fun. About 30 min after you land, you’ll get an email with links to download your hi-res photos and videos and share them with your friends! Between all the check in procedures and training, and some waiting time that is always involved during the high season, you would spend a significant part of your day at the dropzone. So why not pick a place that is comfortable and offers the necessary amenities. Skydiving operations are always located at small airports, but the facilities vary vastly from one to another, and clean bathrooms and free wifi are not taken for granted. At Cross Keys, where thousands of first timers and licensed jumpers come to skydive all year round, you can get a tour of the skydiving facilities, shade and comfortable seating, snacks at our on site restaurant, games to play if you have to wait on a weather hold, and personal attention from our customer service team, who want nothing else but for you to have a fantastic day! Lastly, the easiest thing to check to make sure you’re going to a good place, is the reviews. Check out Google, Facebook and Yelp for the most common things that people say about a particular place. Remember to look for feedback on staff, facilities, video quality, aircraft and gear. You can also check out our recent reviews here! When you’re ready, go ahead and schedule your jump! We hope that you have an incredible adventure!